A recent study has exposed the Bush administration's flagrant disregard for environmental laws. The research reveals that the present us government has systematically tried to undermine the National Environmental Policy Act (nepa), considered the Magna Carta of us policy on green issues. 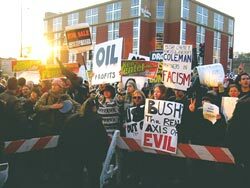 The study, undertaken by activist group Defenders of Wildlife and the Vermont Law School's Clinic on Environmental Law and Policy, examined 172 nepa cases which went to federal courts during the first two years of President George Bush's rule. It found that in more than half of these cases, the administration tried to restrict the application of environmental regulations. The authorities' anti-green arguments were, however, rejected by federal judges in 78 per cent of the suits. "The Bush administration is hell-bent on weakening our environmental protections, and has already established an incredible record of violating the law while doing so," said Rodger Schlickeisen, president of Defenders of Wildlife. "This presidential administration comprises the worst environmental lawbreakers we have ever seen," Schlickeisen added.